How big would have the actual playset been? It's hard to see that turtle figure representing an actual toy figure. How big would have the actual playset been? It's hard to see that turtle figure representing an actual toy figure." 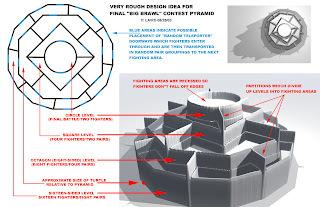 "I'm not sure what "playset" you are referring to -- this post is about a design I came up with for the Battle Nexus arena as it appeared in the animated TMNT tv show. -- PL"
Ohh... yes I see, sorry, I've had toys on the brain lately. I thought I had read something about an arena battle playset at one time as well, and vaguely remember seeing production sketches for it online...? This is awesome. Am I outing myself as a geek gamer when I say it totally looks like something my husband and I ought to borrow for an RPG.